Well, the week has finally come to an end. I hope you all have fun weekends ahead of you filled with lots of stamping! 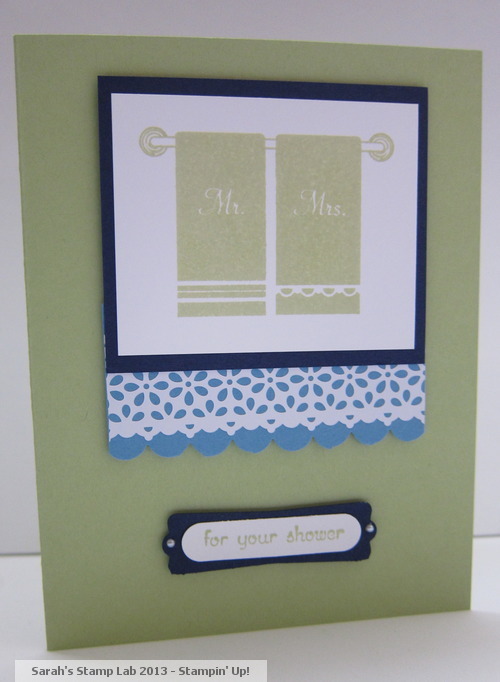 Today I have a card that we made at my recent Brides and Babies Stamp a Stack. It features one of the new single stamps: Towels for Two! I love the effect that the scallop border piece gives to the card. It almost looks like a curtain! It totally does look like a curtain; or an extension of the towel. I was thinking lace trim on a towel. It's lovely either way.